Lucy, Lucy, Lucy! 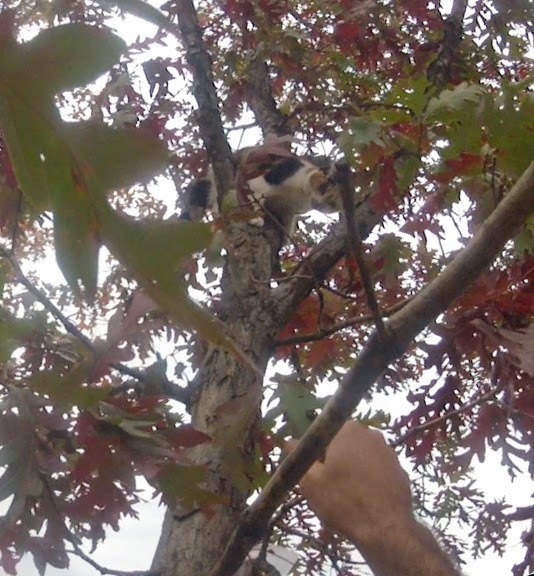 Her human mom, Hannah, moved to a new apartment and amid the moving commotion Lucy got out and ran up a tree. Hannah was worried that if Lucy came down on her own she wouldn’t know where to go and could be lost forever. A tree care company came to help on day 1 but since Lucy is skittish around strangers she went further up the tree and the good Samaritans were unable to get her down. 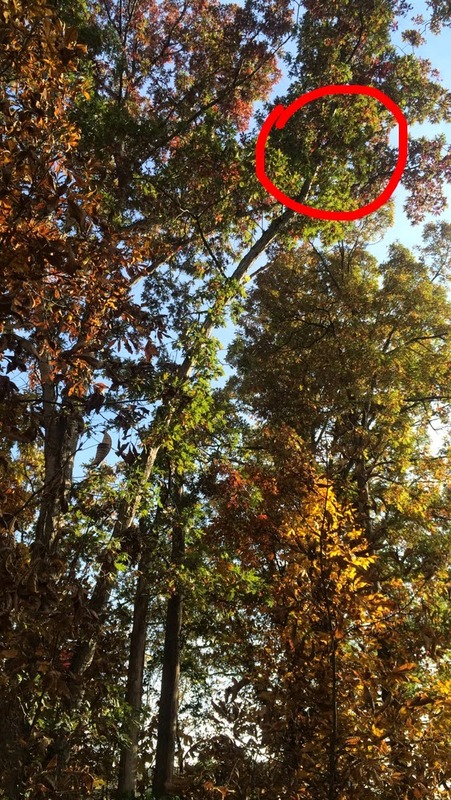 The next day I came out and found Lucy about 50 feet up a leaning oak tree that would not be strong enough to hold my entire weight. I climbed a tall, sturdy adjacent tree and scampered over to Lucy’s tree still tied safely in to the strong tree. The wind was whipping the leaning tree back and forth, which Lucy didn’t enjoy one bit, and then about an hour into the difficult rescue a drenching November rain blew in. Each time I climbed closer to Lucy on the leaning tree, she would go a bit higher just out of my net’s reach. Food wasn’t enough to lure her to me, neither was gentle shaking of the tree, or poking her with a stick. After about 2.5 hours the tree was wet and slippery, Lucy and I were drenched, and I couldn’t safely go any higher in the leaning tree. We had a difficult decision to make: abandon the rescue and hope Lucy would find her own way down at a time when Hannah could lure her into her new apartment, or carefully cut the branch Lucy was on. Despite the possibility that Lucy would lose her grip and fall 60-70 feet to the (clear and soft) forest floor below we decided to make the attempt. My hope was that the limb would pendulum slowly enough that Lucy could stay on at which point she would be beneath me and I could have a better chance of getting her into the rescue bag. I secured the limb so that it couldn’t fall to the ground after it was cut and in so doing land on anyone below. As I slowly cut through the branch it bent then swung predictably toward the trunk. The branch was too heavy for me to handle and Lucy was not able to hold on. She fell to the ground, waited a moment, then ran toward another tree and began to climb it! Oh no! Thankfully her strength was gone and she fell off that trunk after only climbing 10-15 feet up. Hannah gathered Lucy into her arms and she finally relaxed. Once she got her inside, Hannah could tell Lucy’s right front leg was hurt. 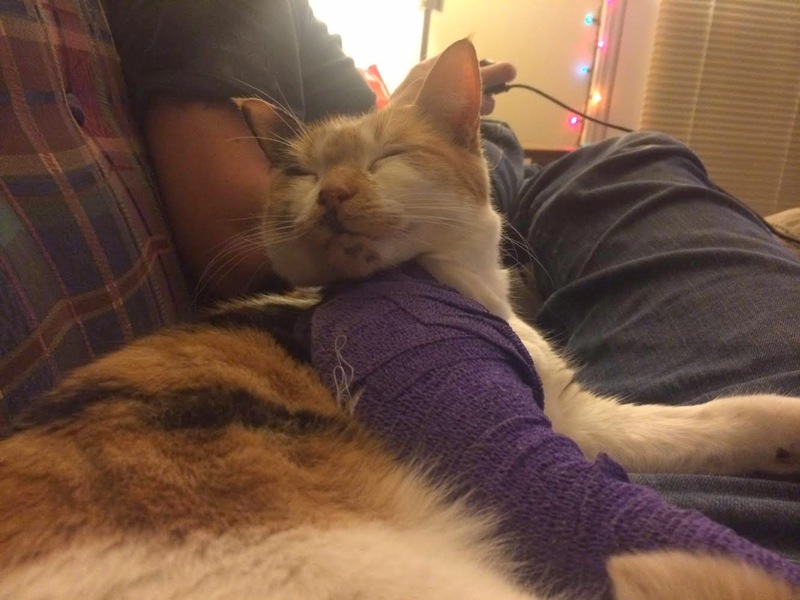 The vet took X-rays and reported that Lucy had a dislocated elbow and had lost a tooth as a result of the fall. Lucy’s prognosis is good and she is in for plenty of TLC (and a couple more vet visits) over the next couple of weeks.